What the Calgary (f)Lames need to do. Home My Stuff Deep Stuff What the Calgary (f)Lames need to do. 1. Start playing hockey. Might be a good idea. Instead of showing up and skating around practising figure skating moves for 20-40 minutes out of a 60-minute hockey game, try playing hockey for 60 minutes out of 60. 2. Trade or release Jarome Iginla. Ranked a disappointing 25th in the NHL for points, a sad 14th in the league for goals, and a pathetic 420th for +/- (-1 +/- score, meaning the other team is more likely to score while he’s on the ice than off) he’s just not performing at the level a “star” or a “captain” should be. 3. Fire Brent Sutter. He was brought in to bring the (f)Lames past the first round of the playoffs. He didn’t. Under Brent’s steady hand, the (f)Lames got worse this year than last. 4. 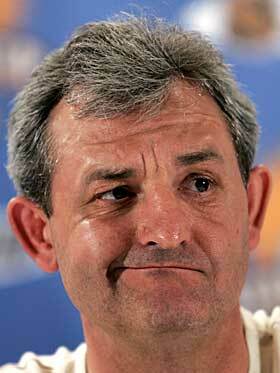 Fire Daryl Sutter. Despite bringing the (f)Lames to the Stanley Cup Final in 2004, the Sutter family has failed to adapt to the new NHL rules implemented since the lockout in 2005. It’s a different game now than it was in 2004, and the Sutter System just doesn’t work. Clearly Daryl Sutter, as GM, is unable to accept this, and continues to hire coaching staff which is “loyal” to his system, so he simply has to go. Unless the (f)Lames can get themselves out of the pattern of playing pathetic hockey, start showing up and playing for 60 minutes a game, and adapt to the new NHL rules, the fans are going to start finding other teams or sports to support, and the next thing we’ll know, the (f)Lames will go the same way as the Winnepeg Jets.